For improved looks and more driving dynamics - in OEM quality. 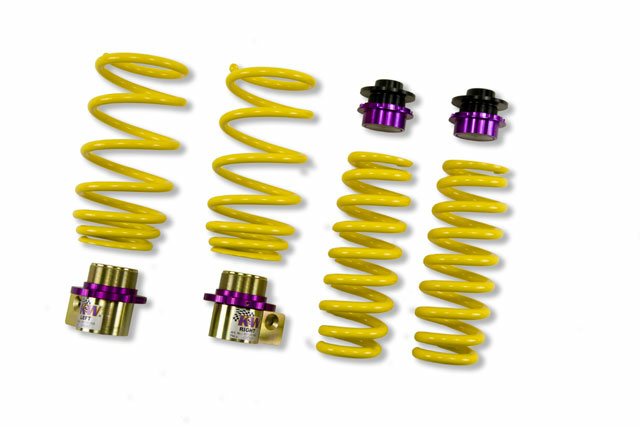 KW height adjustable springs kits are a great alternative to conventional springs. You don�t have to be satisfied with a fixed lowering as you can adjust the height with the KW height adjuster even after the kit has been installed. Your vehicle does not only get a more dynamic look with the KW height adjustable spring kit, but also the steering behaviour and response of the standard dampers becomes more agile. All driver assistance systems and comfort features of an adaptive series suspension remain with our vehicle specific developed spring set up. No more 30-30 or 40-40! With conventional lowering springs you have to decide on the lowering from the beginning, but not with the KW height adjustable spring kits. Depending on the vehicle specific application you can change the lowering within the adjustment range with the threaded spring perch when the springs are already installed. 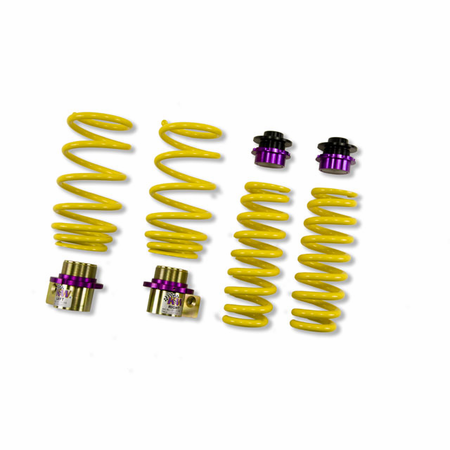 For example, the KW height adjustable spring kit for an Audi S5 allows you to lower the car in the range of 5-35 mm. You will not have any difficulties to adjust the lowering when changing your wheel/tire combination. 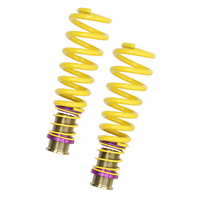 The from KW used high-quality springs made of chrome-silicon steel are at the KW coilover spring kits in their spring rates vehicle specific adjusted to the respective standard suspension dampers and wheel loads. At the development of the respective spring kits we consider that the spring rates will perfectly harmonize with the different damper characteristics of your adaptive series suspension. With their high quality (surface) finish as well as the KW height adjuster, our KW height adjustable spring kits delivery content always includes the vehicle-specific bump stops with dust protection system to protect your standard suspension against tear & wear caused by spray and salt.